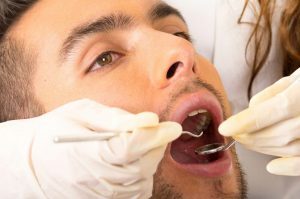 Oral cysts are often discovered during routine dental exams. A cyst is basically a fluid-filled sac. The sac is formed by epithelial tissue, which is similar to the tissue of your skin. When left to grow, cysts can impinge on nerves, other tissues, and teeth, destroying parts of your jaw and dental health. Unlike malignant cancer, there is no risk of a cyst spreading to other parts of the body, but it can do severe harm right where it is. The usual sign of an oral cyst is a small bump in the jaw or mouth. They are often painless and may cause little concern. Cysts should be examined as soon as possible, since they can enlarge, become infected and damage the jaw and teeth when left untouched. Treatment is straightforward and involves first identifying the growth as non-cancerous and then removing it via oral surgery. One of our dentists performs the procedure in the comfort and convenience of the Placerville office of Placerville Dental Group.